U.S., 2011, 83 minutes, 2011, Colour. Freddie Highmore, Emma Roberts, Michael Angarano, Rita Wilson, Alicia Silverstone, Blair Underwood. 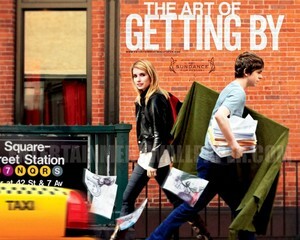 The Art of Getting By is a film about New York high school students. Freddie Highmore portrays George, a pensive 15 year old, whose life experience has shown him little meaning in life. He performs very badly at school, is criticized by his teachers. He meets Sally, Emma Roberts, and they form a friendship. He has problems at home, his mother and stepfather and the mortgage on their house. The film shows George opening up, experiencing new friends, experiencing disillusionment, being pressurized to graduate, and making a decision to do something with his life. Freddie Highmore was a child star in such films as Neverland, Charlie and the Chocolate Factory. Emma Roberts made the transition from teenage star to adult actress. 1. High school story, adolescent development, education, family problems, emotions, philosophy of life? 2. New York setting, the city, homes, streets, high school, authentic atmosphere? Musical score? 3. The title, as relating to George? To Sally? To Dustin? To the parents? 4. The focus and George, age? His voiceover and tone? His questions, not having any answers, no inspiration? Philosophical? But in vain? His relationship with his mother, communicating with her, the tensions, his father leaving the family, his lonely time in Tokyo? Jack as his stepfather, unemployed? George following him? The truth, the confrontation, the violence? His not contributing to class work? Idle, sketching, no respect for his teachers, their exasperation with him? Harris and the art class? The discussions with the headmaster? No tests, no assignments? His future and his of hand attitude? 5. Sally, smoking on the roof, making friends with George, the talk? Zoe, her friend, the poster for the party? His drawing the poster? At the party, sitting by himself? Sally, smart, attractive, sharing with George? Sally and her mother’s behaviour? Her reactions? Introduction to Dustin? Going to his studio, admiring the paintings, friendly with him? George putting her on a pedestal? Going to the club, George dancing, getting lost, being sick? Sally’s apology? 6. George at home, his room, tensions, meals, at school, the ultimatum from the principal and from the other teachers? 7. Jack, wandering, losing his job, George seeing his office, making his decisions? 8. Sally, the sexual attraction, asking George his opinions, imagination, George cautious, hurt, alone, seeing her with Dustin, George discovering the truth? 9. Dustin, past student, visiting the school, his speech? George welcoming him, listening? Discussion afterwards? Visit to the studio? Outings? The dance? George upset at Dustin? To Europe with Sally? The airport? 10. George hard at work, the discussions with his mother, the truth about Jack, losing her money? His art, Harris and his demands about something true? 11. Sally, Dustin, explaining her summer to George, backpacking in Europe, going to the airport, Dustin and his allowing Sally to go, her return to the school, seeing her portrait? 12. George, the teachers pleased with his work, Harris pleased, the graduation, his mother and her enthusiasm, his friends, Sally?